Q: Who is eligible to apply for Partnership for Better Health funding? A: Organizations that apply to the foundation for funding must be 501(c)(3) organizations as determined by the IRS. However, one exception is that school districts are eligible to apply for mini-grants. Mini-grants are requests of up to $5,000. All grants must benefit residents of the Partnership’s defined geographic area. 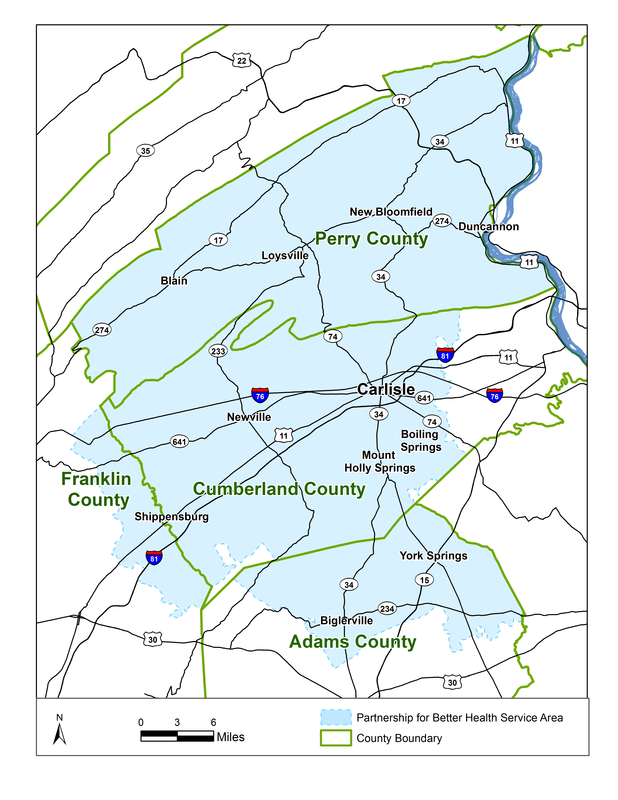 The scope of the Partnership’s service region includes: all of Perry County, Western and Central Cumberland County, Northern Adams County and the Greater Shippensburg area. Q: What does the Partnership for Better Health fund? A: The Partnership makes investments in programs, projects, and collaborative initiatives that aim to build healthy communities; ensure access to affordable health care; and strengthen health capacities. Q: When can I apply for a grant from the Partnership and when will I know if my grant is funded? Q: What doesn’t the Partnership for Better Health fund? Q: How do I apply for Partnership for Better Health funding and who can I contact with questions? A: All applications to the Partnership are received through our online grants management system. If you are a new applicant and have questions, feel free to contact our grants staff before starting your application process. You may also proceed to the “Apply Now” link on our web page. Q: How do I improve my chances of receiving funding? Are there certain criteria that the foundation uses to evaluate grant applications? Q: What are the Partnership’s expectations regarding sustainability? A: The Partnership views sustainability as an organization’s ability to continue a program, project or strategy by securing reliable financial resources and revenue streams to support the effort into the future. Due to the ongoing demand on the Partnership’s grants, each program’s ability to work toward independent sustainability and diversified funding is critical. Q: How long is my project eligible for Partnership for Better Health funding? A: Program eligibility is determined on a case-by-case basis. Some grants may last one year, while others may be renewed for two to three years. Because the Partnership is committed to continually making funds available to support new projects, priority is given to funding projects that can become sustainable over time. It is rare that a project ever receives more than three or four years of total funding. Q: Does the Partnership pay for overhead expenses? A: The Partnership assesses the ratio of overhead expenses to program/service expenses on a case by case basis, seeking a balance of efficiency and effectiveness.